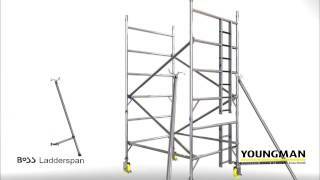 BoSS Ladderspan is the market leading tower system designed for the professional user. The access towers are manufactured using state-of-the-art technology to offer consistent quality. The 33652300 BoSS Ladderspan 3T tower system has double 1.45m frame width that is 2.5m in platform length and 3.2m platform height. Uses 3T – Through the Trapdoor build method so the operator can assemble the system in the trapdoor of the platform.